Summer wedding season is in full swing, and I’ve rolled down Highway 200 three of the past five weekends. It’s a pleasure to be on the guest side of the reception, and though I haven’t catered a wedding for quite a while, I sometimes feel like chef emeritus, taking calls from newbie caterers and DIY mothers of brides, seeking answers to their food questions, such as: How many 10-pound bags of potatoes will I need to prepared potato salad for 250 guests (nine), and how much spinach for my spinach and strawberry salad (a handful per person). I am always happy and honored to provide wedding wisdom and extremely grateful I’m no longer schlepping chafers and coolers to the tops of mountains every Saturday all summer long. My most recent wedding trip was the most fun as all my children (and theirs) gathered with me to celebrate the marriage of their childhood friend. Ironically, it was a childless affair, and I can attest that getting five adults wedding ready, organizing seven children amongst two childcare providers and still arriving in time for pre-wedding duties was alone cause for massive celebration. There’s nothing more nostalgic than the neighborhood lemonade stand. And while we consider lemonade the quintessential all-American antidote to a hot summer day—visions a vintage pitcher filled with cracked ice and the refreshing sweet-tart liquid quenching our parched lips — its origins began in Egypt around 700 A.D. Thousands of years later, about 1870, the first lemonade stands are said to have cropped up in Brooklyn, New York (and I feel most certain my grandchildren could be the direct descendants of those first, youthful entrepreneurs). Whether you’re going all out with a cookie and lemonade stand, or just looking to quench your summer thirst, these recipes for my all-time favorite summer companions will get you off to a good start. And if you like, I can even include some darn cute grandkids. 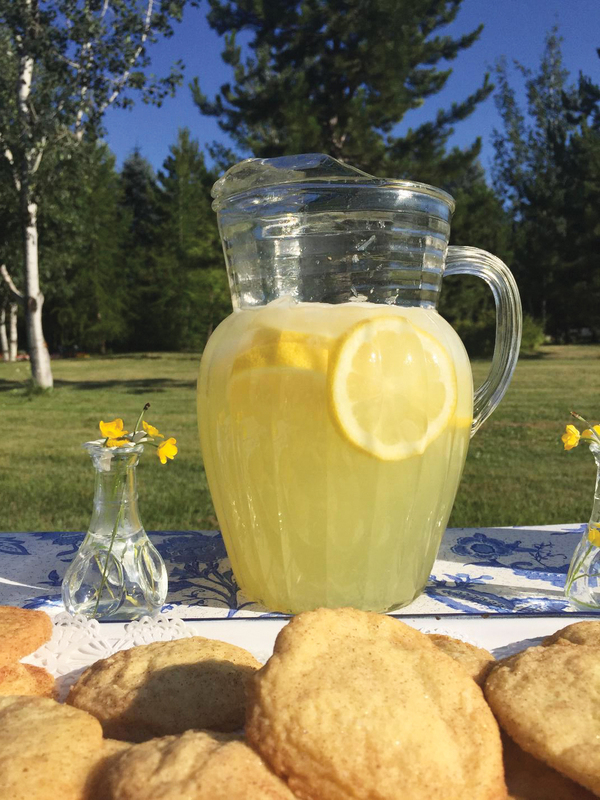 Snickerdoodles are a summertime favorite, and a sweet treat to tuck into your picnic basket. The secret to a perfect snickerdoodle, which has a crisp edge and soft center, is to chill the cookie sheet (and don’t overbake)! With paddle of standup mixer, cream butter, 1 ½ cups sugar, 1 tsp of vanilla extract and eggs thoroughly in the bowl of mixer. In separate large bowl, whisk flour, cream of tartar, baking soda and salt. Add dry ingredients into butter mixture and mix just until blended. Chill dough, and chill ungreased cookie sheets for about 10-15 minutes in the fridge (or freezer). Then, mix 3 tbs sugar, and 3 tsp cinnamon in a shallow dish. Scoop 1 inch balls of dough and drop into the sugar/cinnamon mixture and gently roll balls of dough in the sugar mixture. Place on chilled ungreased cookie sheet, and bake 10 minutes. Remove from pan immediately and cool on wire rack. Once the sugar has dissolved in the water, remove from heat and let the zest seep in the simple syrup for several minutes, then strain out the zest when you add the simple syrup to the lemon juice (keep a jar of zesty simple syrup in the fridge for all your favorite summer beverages). For a refreshing twist, try adding crushed raspberries or strawberries, or fresh mint leaves to the simple syrup and lemon juice. Place the sugar and 1 cup water in a small saucepan and bring to a simmer. Stir so that the sugar dissolves completely and remove from heat. Chill overnight if possible, but at least a couple of hours. Pour the juice and the simple syrup into a serving pitcher. Add 2 to 3 cups of cold water and taste, adding more water if needed. If the lemonade is a little too sweet, add a little more lemon juice to it. Serve with cracked ice and top with lemon slices.